I was having 'tune-block' trying to pick out a song for today and so I went to good ol' YouTube. There she was, on the front page. Pink. While I'm not the hugest fan of Pink, I do really like more than a few of her songs. The one I picked for today is called Get This Party Started. I have always loved the video; it's just so fun and colorful. Plus...there's a remix out there featuring Redman where they mix this song with Annie Lennox's "Sweet Dreams (Are Made Of This) that is an absolute banger! It's the perfect song to put on when you're working out or cleaning or just feel like bouncing around! I've added a YouTube video of that one as well, just so you can hear it. There's no video, just the song. Warning: there might be some naughty words in this one....I can't remember? 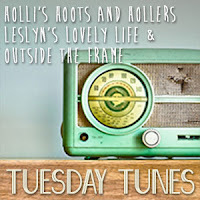 As always, I'm linked up with Tuesday's Tunes at Leslyn's Lovely Life!